There were several sources of funding for Cambridge students including the Prendergast Greek Studentship and the Craven Studentship (both worth £200), and the Cambridge Studentships (initially worth £50, and then £100 but awarded in alternate years). Edward Frederic Benson (1867-1940). King's. BSA 1891/92 (Worts Fund). 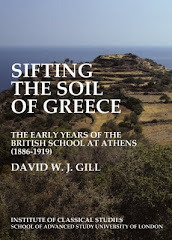 The Fund awarded the BSA £100 per annum, initially for three years, 'with a view to encouraging archaeological research in Hellenic lands' (October 1895). 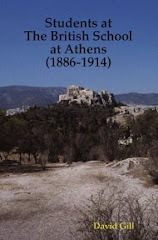 Alan J.B. Wace and John P. Droop were awarded £30 'towards defraying the expense of an excavation to be undertaken in Southern Thessaly' (December 1907). 1887/88: Montague Rhodes James (1862-1936). King's. 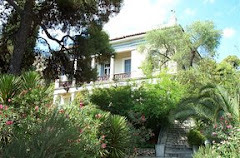 Grant of £100 from Cambridge University for work on Cyprus. 1901/02: Elizabeth Hilda Lockhart Lorimer (1873-1954). Girton: Pfeiffer Studentship, £40 (1901/02), 'to proceed to Athens to study Athenian vase paintings of the latter half of the fifth century B.C.'. 1903/04: Margery Katharine Welsh (1880-1960). Newnham: Marion Kennedy Studentship from Newnham College 1903/04. 1903/04: John Laurence Stokes (1881-1948). Pembroke: Prior Scholarship from Pembroke College 1903/04.